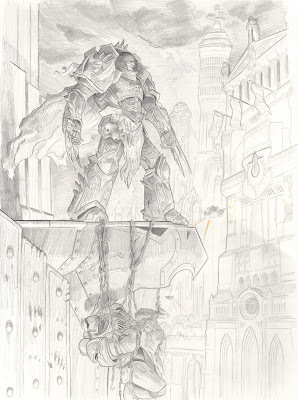 Konrad Curze is my least favorite of all the primarchs, and this the 5th piece in the Primarch series I’m working on. Here he is on the peaceful planet Ultramar running rampant creating chaos. I took a break from Xenofera yesterday and drew this guy up. I’m hoping I can get him all colored and ready to go by Naka-Kon which is less than 2 weeks away.